Scientists have built and tested a form of invisibility cloak that can hide objects from heat. 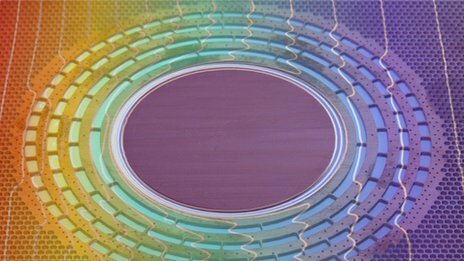 Similar cloaking efforts are underway to make objects invisible to light and even sound waves, but this is the first device to work with heat. The prototype, to be outlined in Physical Review Letters, contained a 5 cm-wide flat region impervious to heat flowing around it. The technology could be put to use in thermal management in electronics. The theoretical ideas behind the prototype were outlined in a paper by French researchers in 2012 – now made real in copper and a silicone material called PDMS. It works by channeling heat flow around the central region, with carefully designed, alternating rings made of the two materials. “If you follow a ring around, you can follow those areas of high [heat] conductivity, but if you go toward the centre you are repeatedly blocked by a layer of low conductivity,” explained lead author of the study Robert Schittny of the Karlsruhe Institute of Technology in Germany. “You can see that it’s easier for the heat to just travel around this object than travel toward the centre,” he said. But the effort is not just about insulating the central region from heat – it is to make it “look” like it is simply not there. “You want the heat flow to look as if there were no disturbance at all in the middle, and basically if you want to guide the heat around the central part, it takes a detour, a longer time to go around there,” Robert Schittny explained. Robert Schittny said that the work showed promise for applications where heat needed to be carefully shuttled around – electronics systems, cooling or energy systems, and so on. And the prototype works just as the 2012 work predicted it would. “We were all surprised by how well the theoretical simulations and the experimental results in the end agreed,” he said.